FRIENDS! THE MUSICAL PARODY is an entertaining trip down memory lane. Why See Friends - The Musical Parody? Rachel, Ross, Chandler, Phoebe, Monica & Joey are back! Friends! 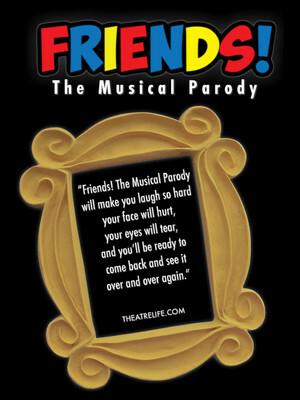 The Musical Parody transports audiences back to the show's most iconic moments, from Ross' Unagi martial arts mishap to Phoebe's, shall we say, interesting rendition of Smelly Cat to the will-they-won't-they drama between Rachel and Ross. Telling their beloved tales through hilariously self-aware spoof songs like 'The Ballad Of Fat Monica', '495 Grove Street - How Can We Afford This Place' and 'Oh. My. God. It's Janice! ', an able-bodied cast sings and dances their way through a fast-paced trip down memory lane that'll have you shouting "PIVOT!' all the way home! Sound good to you? Share this page on social media and let your friends know about Friends - The Musical Parody at Charline McCombs Empire Theatre. Please note: The term Charline McCombs Empire Theatre and/or Friends - The Musical Parody as well as all associated graphics, logos, and/or other trademarks, tradenames or copyrights are the property of the Charline McCombs Empire Theatre and/or Friends - The Musical Parody and are used herein for factual descriptive purposes only. We are in no way associated with or authorized by the Charline McCombs Empire Theatre and/or Friends - The Musical Parody and neither that entity nor any of its affiliates have licensed or endorsed us to sell tickets, goods and or services in conjunction with their events.